The south-western part of the Arabian Peninsula has been a centre of culture for thousands of years. Today this area is broadly covered by modern Yemen. This is the first in a series of posts highlighting Yemen’s rich cultural history. 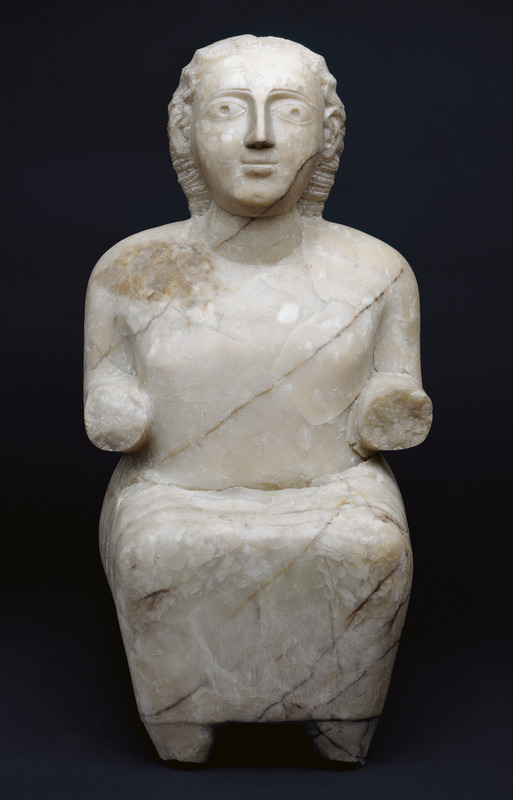 One of the characteristics of ancient South Arabian culture was the great attention paid to representing people at their best, as personal sculptures. 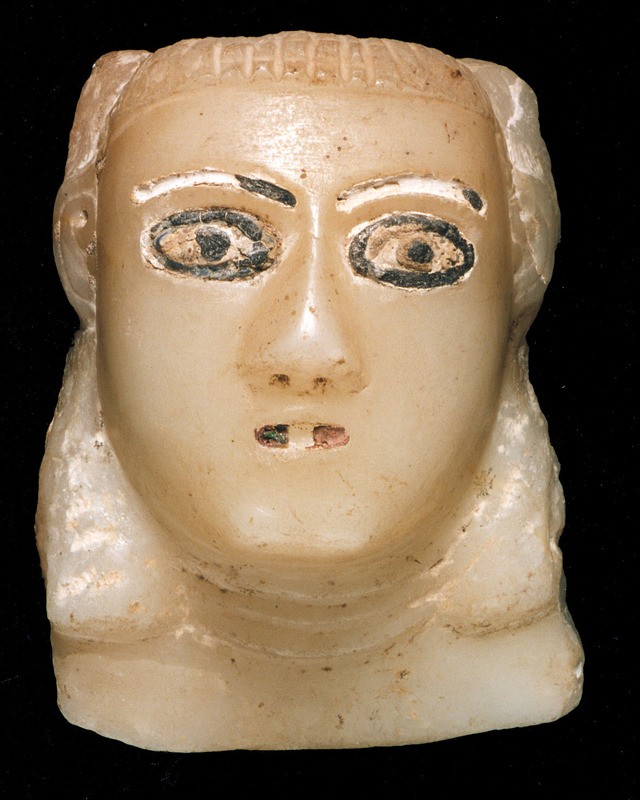 Although each is recognisably of this culture, the variations in detail, style of dress and facial appearance suggest that there was a real effort to represent real individuals but in a general style and using materials and techniques which are typical of ancient South Arabia. Both of these exceptional sculptures are carved from a fine calcite-alabaster. Representing a woman and a man, these heads were originally placed in tombs as personal memorials. Scientific analysis at the British Museum has shown that the inlay in the mouth of the sculpture of the woman was made of red glass set into matching paste. This was to imitate the colour of her lips, perhaps as an early representation of lipstick, whereas her eyebrows, irises and eyeliner were indicated with inlaid strips of glass coloured blue with cobalt (now appearing almost black). On the man’s head the eye sockets were inlaid with shell and presumably stone for the pupils, and also highlighted with a vivid blue eyeliner (again, made of strips of glass coloured with cobalt). This imitates the common use of eyeliner such as kohl, which was popular among both men and women – not only a means of enhancing facial features, but also to reduce solar glare. 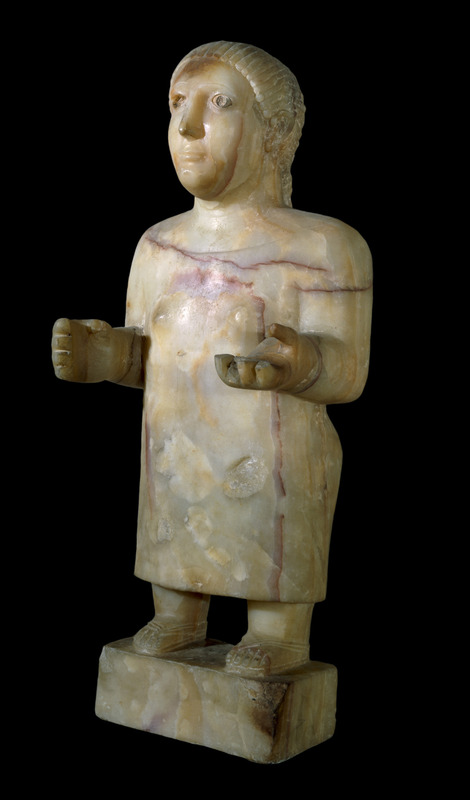 The most common type of sculpture of South Arabia is small human statues which were placed in tombs or in temples as votive offerings. These were acts of piety, invoking the favour of the god, but were also a public display of the donor’s wealth and status. We can’t tell how such sculptures relate to cult images, as we don’t know what form the divine image in a temple took. The statues also provide details of the clothing and hairstyles of the local people. 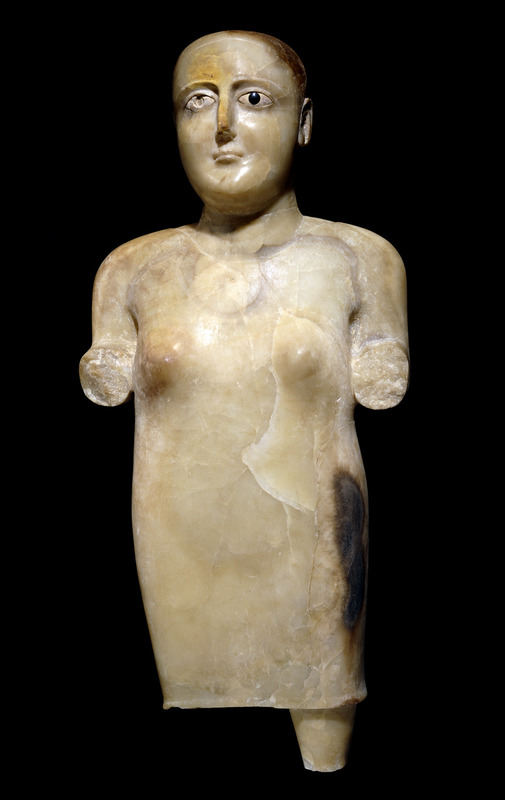 This figure above probably represents a wealthy woman. She is standing in an undecorated garment, wearing sandals. This type of footwear is depicted on bronze statues and is sometimes found on mummified bodies in parts of Yemen. 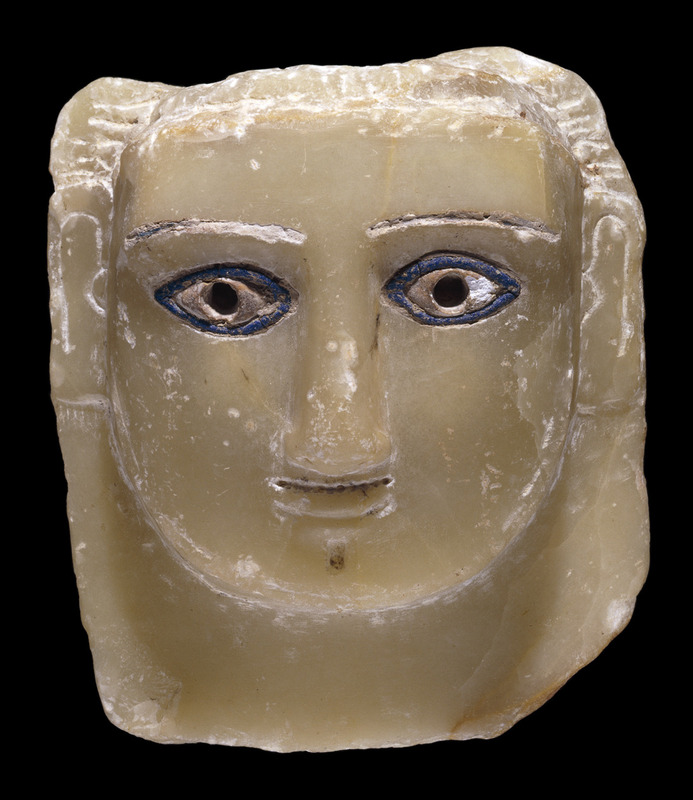 In most other societies, sculptures were coloured, but in ancient South Arabia this stone was considered sufficiently beautiful in its own right to be left unpainted. The wealth of the donors of such statues must in some cases have derived from the fact that the southern Arabians had the monopoly on two of the most prized materials of ancient times – frankincense and myrrh. These two aromatic resins only grow in eastern Yemen, southern Oman and Somaliland. Their production and trade was in the hands of the ancient south Arabians. Every temple or wealthy home in the Mediterranean and Near East required them, and purchasers were prepared to pay their weight in gold. The south-western part of the Arabian Peninsula has been a centre of culture for thousands of years. Today this area is broadly covered by modern Yemen. This post is part of a series highlighting Yemen’s rich cultural history. The ancient South Arabians had many gods. Though the pantheon – the whole group of gods – is not well understood, we know that several tribal groups had their own divine ‘patron’. This bronze plaque was originally nailed onto a temple wall as a permanent reminder of the act of dedication to a private individual. It was probably used as an offering to the god Almaqah, the national god of the kingdom of Saba. He may have been a moon god, or perhaps a male version of the important south Arabian sun goddess Shams. 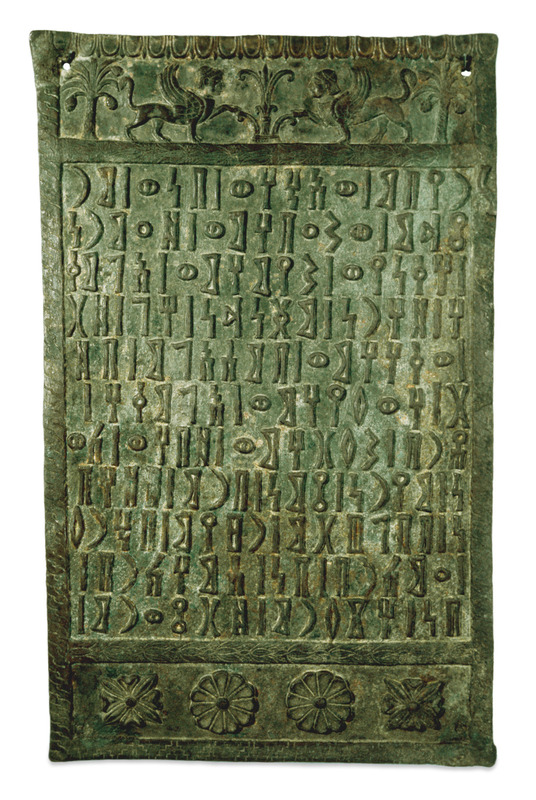 The inscription, in the Sabaean language, identifies Almaqah as the god of Hirran and records that the tablet was dedicated by Riyan and his brothers, the grandsons of Marthad of the tribe of Dhu Amran. The decoration at the top shows a pair of sphinxes flanking a lotus blossom and framed by date palms in full fruit. This plaque was discovered in the highland Yemeni town of Amran during house construction during the 19th century. 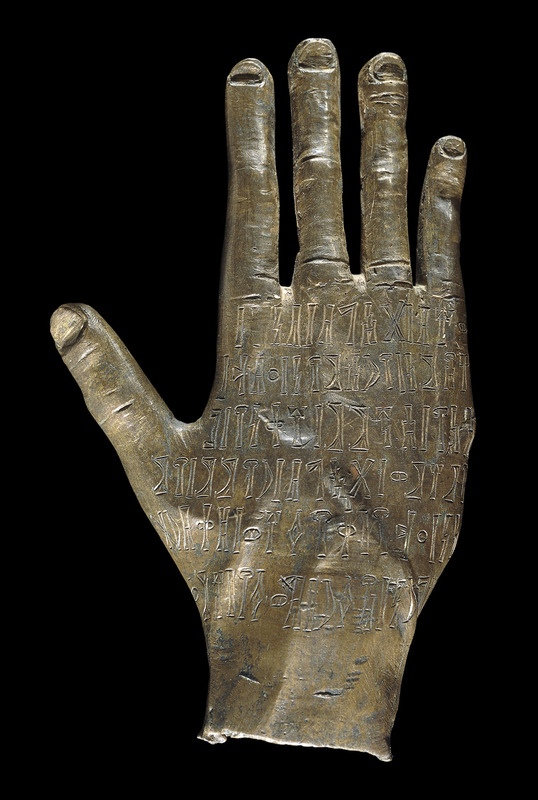 This bronze hand was an offering left in a temple as a pious act by the donor, and refers to the god Ta’lab. In the kingdom of Saba, the oldest and most powerful of south Arabia, the god Ta’lab was the patron of the tribal federation of Sum’ay. The worship of Ta’lab included pilgrimages to his shrine and a ritual meal. By the end of the 4th century AD monotheism – the worship of a single god – was spreading. References in inscriptions to Ta’lab and other gods were superseded by Rahmanan, ‘Lord of Heaven and Earth’. Such ideas were influenced by Jewish and Christian communities that had established themselves in Yemen at this time. The inscription on this hand is in Sabaean, one of several related Semitic languages spoken in ancient South Arabia.